Avid Introduces Pro Tools 12.2 with new features and plug-ins! Now included in all active Pro Tools Annual Upgrade and Support Plans as well as subscription licenses are the Space convolution reverb and 16 brand-new stompbox effect plugins inspired by Eleven Rack. Add grit, space, modulation, and overdrive to your guitar tone and more with this bundle of stompbox-type effects from our Pro Tools | Eleven Rack amp/cabinet emulation system. This new collection of 64-bit AAX Native, AAX DSP, and AAX AudioSuite plug-ins are modeled after the circuitry and design of many classic and popular analog guitar stompboxes and effects—from EQ and compressor, to reverb, delay, modulation, and distortion effects. Pro Tools | HD customers, in addition to the 16 Eleven stompbox effects and Space, also get all five Avid Pro Series plug-ins (Pro Compressor, Pro Expander, Pro Limiter, Pro Multiband Dynamics and Pro Subharmonic), the Eleven amp/cabinet simulator plug-in, ReVibe II a powerful room-modeling plug-in, and Reverb One plug-in an uncompromising sonic quality reverb that's also easy to use. One of the big announcements is the addition of yet more HD only features into standard Pro Tools. VCA Faders - These tracks emulate the voltage controlled amplifier channels that you can find in some analog consoles. VCAs work as master faders for mix groups. They can be used in a very similar way to bussing to Aux Inputs and submixing but there are crucial differences in terms of signal path. One helpful feature of this method of mixing is that the VCA offers level control over the source tracks even when the group is disabled so you can have the source track faders for blending relative levels and VCAs available for balancing groups of channels from a handful of faders without having to manage the on/off status of the mix groups. No-group groups! Advanced Metering - 17 different metering formats - Linear, Linear Extended, RMS, VU, Digital VU, PPM Digital, PPM BBC, PPM Nordic, PPM EBU, PPM DIN, K-12, K-14, K-20, Venue Peak & Venu RMS. It is interesting that they still haven't included BS1770 loudness metering for ATSC or EBU R128 specifications. Disk Cache - This enables you to play large sessions of lower grade storage or even network attached storage by preloading the media from the session into RAM. In the Playback Engine the Cache Size setting how much Memory (RAM) the Avid Audio Engine (AAE) allocates to pre-buffer audio for playback and recording. In most cases, the default setting of Normal is the best Cache Size for most sessions. Now you obviously need a lot of RAM but you can configure how much RAM Pro Tools can use and PT will start loading media into RAM working from both sides of the cursor until the whole session is loaded or it fills the RAM you have allocated. The existing Annual Upgrade and Support Plan for Pro Tools—available at the same great price of $199—now comes with even more value, with the addition of a new bundle of 17 plug-ins. This gives all current Pro Tools 12 customers access to these amazing creative tools while their plan is active. And to give customers even more affordable options to stay on top of the latest software upgrades we’re announcing two new annual plans. * Only eligible to Pro Tools 11 customers. Upgrades from Pro Tools 9 & 10 require purchase of $199 Annual Upgrade and Support Plan. Starting in 2016 the $99 Annual Upgrade Plan will also be available as a plan renewal to Pro Tools 12 customers. ** Only eligible to Pro Tools 11 customers. Plug-in bundle available to Pro Tools 9 & 10 owners through $199 Annual Upgrade and Support Plan. Starting in 2016 the $99 Annual Upgrade & Support Plan will also be available as a plan renewal to Pro Tools 12 customers. As previously announced, the new Annual Upgrade and Support plans for Pro Tools | HD now also have flexible options for accessing the most current software updates with lower priced annual renewal and reinstatement plans. Pro Tools perpetual licenses are now available for the new low price of $599—that's $300 less than the previous price. This new price includes a 1-year $99 Annual Upgrade Plan plus one-year access to a new plug-in bundle. Avid Standard Support can be added for $99. Pro Tools also gets some new features for greater mixing performance with even more advanced tools. Mix and control groups of tracks faster and easier with VCA Masters. Mix with confidence using 17 advanced metering options, including K-system, VU, and other professional standards. Get gain reduction metering on every channel to gauge dynamics. And get smoother performance and highly responsive recording and playback with the extended disk cache, which loads entire sessions into RAM—no matter how large. 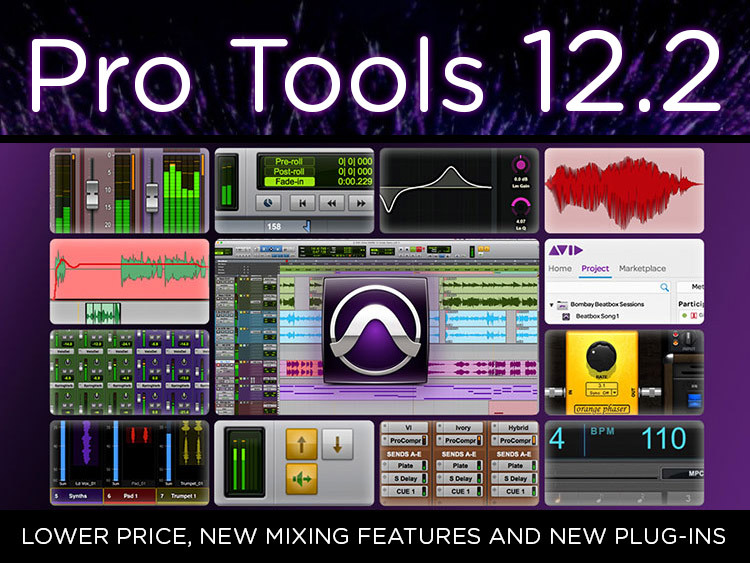 Contact an RSPE representative or shop online to purchase Pro Tools 12.2 from RSPE!